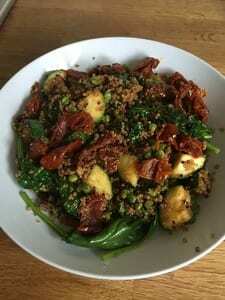 >> Healthy eating – Day 18 – What food does Rebecca Boulton eat? Find out here….. Healthy eating – Day 18 – What food does Rebecca Boulton eat? Find out here…..
Rebecca Boulton is a Nutritional Therapist from Yorkshire and runs https://rebeccaboulton.com. She provides Nutritional Coaching for busy women struggling with hormonal imbalances who want to transform their bodies, health and lives with simple diet changes. So what food does Rebecca eat? Here she tells us. My day always starts with a large glass of tepid water with a squeeze of fresh lemon and apple cider vinegar to help kickstart my digestion and support the liver. The best way to have this is on an empty stomach. I make sure I stay hydrated throughout the rest of the day with plenty of water, green and peppermint tea. I love coffee and for me it’s the hardest thing to give up, but I am quite sensitive it and it sends me cortisol levels up so I only have 1 (2 max) cups a day. I have good quality fresh coffee with coconut oil to help calm the nervous system and for some healthy fats. I get up before the kids so I can get some exercise in and also do some meditation and journaling while I have some peace. I meet a friend at 6am twice a week for a HiiT workout and then a couple of days I do kettlebells in my garage. I’m a bit lazy so I like the quick workouts which give maximum results and those work best for me. Other days I’ll just have a bit of a stretch to wake myself up! I’m not naturally a morning person but I find this helps me start the day calm and energised instead of rushing around stressed out trying to fit everything in like I used to! 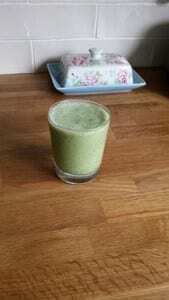 Breakfast is usually a green smoothie (with extra protein powder like Sunwarrior or Purition for workout days to help with recovery) made with spinach or kale, some berries or half a banana, almond milk and some flaxseeds and chia seeds. Often I add in some cacoa powder for magnesium or spirulina if I need an iron boost. So, I don’t wake the kids, I make it up the night before and store in the fridge as my nutribullet is pretty noisy and I don’t want to disturb them (or my peaceful morning!). I’ll follow the smoothie with either some scrambled eggs with avocado and spinach or homemade muesli with yoghurt and berries. For me, breakfast is the biggest meal of the day as that is when I am most hungry! Once I’ve got the kids to school, I spend the rest of the morning at my desk until lunchtime. I usually break about midday and have a walk around, stretch off and some lunch. Long gone are the days of scoffing a sandwich at my desk without even noticing what I’m eating, while still working! Nowadays I understand the importance of mindful eating and ensuring I focus on what I’m eating and when I’m full up. One of the things I’ve found with my clients is that they are no longer able to recognise the signs and just eat until they have emptied their plate. Stepping away from your desk and taking time to breathe and relax is also important for you mentally and emotionally in helping to reduce overwhelm and stress. Lunch is an omelette (if I haven’t had eggs for breakfast! ), a salad with chicken, salmon or prawns or some quinoa with roasted vegetables. I plan all my meals in advance and pre-prepare as much as I can which always helps me make better choices. I take a couple of hours at a weekend or after school to prep veg, chicken, fish, make a healthy cake or muffins and protein balls to keep in the fridge. It saves time, money and stress! After I’ve picked the kids up, we always have an after school snack (usually oatcakes and hummus, fruit with some nuts or a Nak’d bar if we’re in a hurry). We often go a long time between lunch and dinner and it’s important to make sure your blood sugars don’t crash as this can make you tired, irritable and find it difficult to concentrate. As I don’t normally eat until 8pm I need something to keep me going or I am grumpy mum and just want a snooze on the sofa. Dinner is usually fish or chicken with roasted vegetables, a stir fry or a curry. We’re big fans of the quick and easy option. I also love my slow cooker and use to make big batches of chilli, stews and roasting joints of meat. For me, it’s all about keeping it as simple as possible, being prepared so I get everything my body needs without it taking over my life, and allowing room for the odd chocolate, glass of wine or meal out! Thank you Rebecca for sharing your food day with us and that steady energy sounds great!